A garniture is a collection of matching, but usually not identical, decorative objects intended to be displayed together. The word garniture derives from the French verb garnir, which means 'to garnish'. These pieces are made using the roll-up technique, an adaptation of a Venetian method used by glass blowers for centuries. 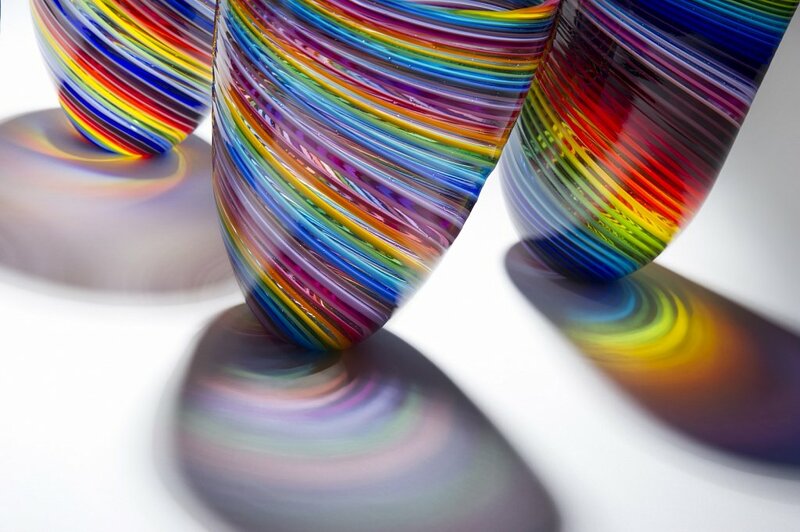 The vessels are made from pre-fused glass sheets that are picked up hot, rolled and hand blown. The roll-up technique allows me to create three dimensional objects that have a greater level of control and design than can usually be achieved in a hot shop. The final process happens once the glass has cooled. The piece is finished by polishing the pontil mark, the scar left from where the punty iron was broken from the bottom of the vessel. The presence of such a scar indicates that the piece is hand blown.